I see the IR sensor is a distance sensor that puts out a .4-2.4 VDC (typical) signal depending on distance to the reflected object. What is the motor supposed to do? Are you planning on driving the 10VDC motor directly off of an analog output? Are you sure the output can supply sufficient current? Even if it can supply the current, I'd be very hesitant about doing this. I know that in things like RC cars they usually connect a small cap across the motor to help reduce backfeed noise that the motor is sure to generate. Even with a cap, the motor will generate sometimes and backfeed power into your PLC output. RC cars use speed controllers with circuits that are designed to deal with this. PLC analog outputs are not. Maybe I'm overreacting or not understanding your plan, but this sounds to me like a recipe for burned out analog output cards (and those are pretty expensive). analog signal controlling an analog output signal in RSLogix 500? How do you adress the bit inputs and outputs? I:3.0 I:3.1 and O:3.0 and O:3.1. I`m like jimbo3123 i don`t understand what your trying to do either, but what ever it is this will help on the addressing???? I am just learning about this myself at class. What he is doing sounds similar. IR output is say 4 to 20 mA. This correspond to bit values 0 to 1600. I picked these numbers out of the air, 1600 is evenly divided by 4, 20 and 10.
the bit values would correspond to a voltage output range of 0 to 10 VDC. 12 mA = bit value 800 = 5 VDC output. 20 mA = bit value 1600 = 10 VDC output. Have I got the picture OK ?? This correspond to bit values 0 to 1600. Have I got the picture OK ?? Dan if 20 ma equaled 1600 then 4 ma would equal 320. 1600/20*4 . Now if you scaled this into 0 to 10. 320 would be your input low 1600 the Hi. 0 would be output low and 10 would be the output Hi. I sure hope this is right! there is another thing with the little sensors you want to use. they are not intended for 24VDC operation and the output is not linear. If you want to have your output follow your input,say when the input is at 50% of full range, the output will be at 50%, just use two SCP's. Scale the input using the raw counts of the input card to what ever range you want, lets say 0-100%. 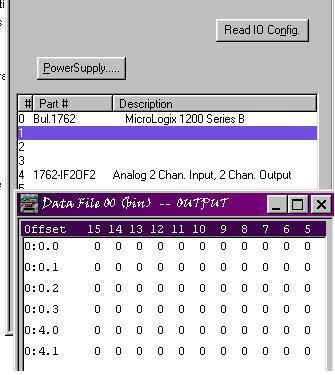 Then the second SCP would have 0-100 as the input min and max, the output min and max would be the raw count values of the output card, the destination would be the output address O:1.0 or such.